Given the iPhone’s ability to locate itself (precisely, for an iPhone 3G, and roughly, for a first-generation iPhone or iPod touch), it’s not surprising that a number of location-aware programs have sprung up in the App Store—you can find programs that will track your iPhone via its GPS chip, show you where your friends are, and tell you which businesses and places of interest are in your immediate neighborhood, such as Yelp. Another task that seems to fit well with a location-aware iPhone is finding the nearest—and least-expensive—fuel for your vehicle. In this era of $4.00-per-gallon gas—yes, non-U.S. readers, we know we have it comparatively easy—saving as much money as possible on a fill-up is a good thing. But can the iPhone really help you save both time and money by finding the least-costly nearby gas station? To answer this question, I installed three gas-station-locating applications on my iPhone 3G—the free GasBag, the $3 iGas, and the free MyGasWars—and put them to the test. (Note that some of the multi-service location-aware applications also include gas finders; I’ll cover them briefly in the Other Options section. In evaluating these programs, I tested them from my home (wireless network), from a location in the downtown area of our mid-size suburb (3G network), and out in the country (EDGE network). I was curious as to how many stations would be found in each location, how accurate the provided pricing info would be, and how easy it was to get driving directions from your current location to a chosen gas station. The country location in particular was chosen to see how well the programs worked away from a population center—it’s usually pretty easy to find a gas station in the city. The spot I picked was actually in the parking lot of the only gas station within about a five-mile radius of that spot, and it’s not a chain gas station, making it less likely that it might reside in a database somewhere. I was curious to see which of the programs would know about this out-of-the-way station. So how well do these programs work, based on my testing? Well enough to find a nearby gas station, certainly, but no program I tested found all the stations in any given area. I also experienced crashes, poor performance, and obvious missing features in a couple of the programs. The good news is that only iGas costs money, so it won’t cost you anything to test the other two in your own area. My Gas Wars uses a database of user-contributed station and pricing information to show stations in your area. Unfortunately, this program’s limitations far outweigh its features. It takes a very long time to load—30 seconds or more on a 3G network, and longer on EDGE—and it missed not only my rural station, but a number of stations around our home. The map display is an odd mix—it’s a map on the top, with an attached text display at the bottom, and depending on where you drag your finger, you either scroll the whole page or just the map view. Instead of showing the actual station on the map, My Gas Wars assigns a letter to each match, and shows the price per gallon next to the letter. You then scroll down to the text area to see the station’s name, pricing information, and address—but you can’t get driving directions to those locations, nor are the distances to the stations displayed anywhere. My results also included convenience markets, such as 7-11, which don’t offer fuel in Oregon. Even for those stations that My Gas Wars found, pricing information was lacking—of the 10 results listed near our home, six were 7-11s, and one of the four gas stations had no pricing information. Due to the below-average performance and missing features, I wouldn’t recommend My Gas Wars at this time. iGas, the only program with a price tag, is also the only program that doesn’t use a user-generated database for station information. Instead, iGas uses data from Oil Price Information Network, which should give it an edge—in theory. Unfortunately, missing features and usability issues make iGas hard to use and difficult to recommend. While the program did display pricing information for all 10 stations in its results list (along with the date and time those prices were last updated), the distance to each station is not displayed. The list is sorted from lowest to highest cost (and the order can’t be changed), so the first entry on the list may be the farthest from your current location—not what you want if you need gas now. A Map button lets you see all 10 matches on a map, but your current position isn’t displayed on the map—making it really hard to figure out where you are relative to the 10 matches. You can click on one of the markers to see the station’s name, address, and price information—but there’s no way to get driving directions to that station on the map view. Instead, you need to return to list view, click on a station’s name, and then tap the address to get the driving directions. I found that the map view was very jerky when scrolling, and took a while to load, even on a 3G connection. In addition to these issues, iGas crashed on me a number of times, usually when I was trying to open or navigate around the map view. One final issue is that iGas isn’t actually sold—it’s licensed on an annual basis. One year after purchase, the program will stop retrieving data until you buy a “renewal application.” Given that iGas uses a commercial pricing database, I understand the need to cover the annual license fees, but with two free competitors in the niche, this may be a tough sell. GasBag, like My Gas Wars, uses a user-built database of stations and pricing information. Of the three programs, GasBag has the best user interface, and performed quite well in my testing. To help grow the database as quickly as possible, the developers have made adding stations and pricing information about as easy as it can be. You can update prices for any existing station with only a few taps, and adding a new station isn’t much harder than that. As an example, GasBag didn’t find the station in my rural test, so I added it (and its pricing information) to the database. Less than 10 hours later—I’m not sure exactly when, as I added the station just before turning in for the night—the station and its prices appeared in GasBag. During my other tests, GasBag found all the stations around my home, and most of the downtown stations. When you launch GasBag, the program asks for permission to use your current location, and then displays a map showing that location, and icons for nearby gas stations, as seen in the image at right. On each icon is both the company logo (Shell, 76, etc.) and the price (if someone has submitted pricing info) for your preferred grade of fuel—there are the most prices available for regular unleaded, so that’s what I left my preferences set to display. You can also use the magnifying glass icon to search any area of the country by town name or zip code, so you can quickly see what sort of coverage your area has—or the coverage for an area you’ll soon be visiting. I ran a few trials with major cities such as Sacramento, Denver, and Chicago, and there seemed to be good coverage there as well. Smaller towns may not be so well represented, however. The map works (more or less) just like the Maps application on the iPhone. You can pinch and zoom to change the magnification level, and scroll the view around with a finger drag. Loading the map can be a bit slow, especially on the EDGE network. Once loaded, moving and zooming is relatively smooth, though not as smooth as the Maps application. The icons on the map can be somewhat slow to show up—I would guess because the program needs to pull the information for the badge from the server. Another odd quirk is that, even after you’ve seen a station’s icon once, if you then scroll the map and scroll back, that icon may have vanished, and will take a bit of time to reappear. Tapping a station’s icon gets you a screen where you can switch to the Maps application to get driving directions, and see and/or update that station’s pricing information. There’s a bonus feature in GasBag as well—a built-in mileage tracking application. Just tap the Buy Gas Here button on the Station Details screen, and enter the details of your purchase. The program will then track your mileage and spending over time. What are the downsides of GasBag? The biggest drawback is that it is a community-built database, so depending on where you live, the results may not be overly useful. It’s also fairly new, so the database is small but growing rapidly as more people start using the program. Initial reviews on the App Store, for instance, noted that there were no matches in Sacramento. When I checked Sacramento just before completing this review, there were at least two dozen stations listed. Coverage in the Portland area seemed pretty good, as it found all of the stations near my home, and most of them in the downtown area. GasBag’s speed is fairly good on 3G, and somewhat on the slow side over EDGE—the map can take a while to appear, and a while to update as you scroll about. To be fair, though, none of these programs were all that fast when on EDGE—there’s a fair amount of data coming down to the iPhone, and that takes some time to collect it all. There are at least four free multiple-services location apps that offer gas finding features—the previously-mentioned Yelp, AroundMe, iWant, and Where. Of these programs, I felt Where offered the best gas station finder, when considering features and performance. Where found my rural station (AroundMe was the only other program that did so), but fell short when finding all the stations near my home and around downtown. You can view the results in both list and map views, with the list view being the most useful to me—it displays the stations, the distance to each one, and the price for a chosen grade of fuel. I found the map to be somewhat slow when scrolling, and it loads slowly, even on a fast 3G connection. 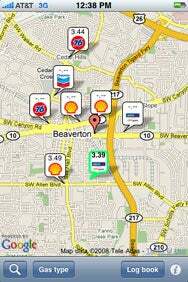 Where uses data from GasBuddy, which is a user-created database of gas stations and pricing. I compared the prices in Where with those on the GasBuddy website, and found a few instances where the pricing was newer on GasBuddy, so I’m not sure how often Where’s data is updated. Unfortunately, you can’t upload new stations or gas pricing information to GasBuddy directly from Where; you have to switch to Mobile Safari and do that directly on the GasBuddy web site. Despite the limitations, Where offers a decent gas station finder as part of its suite of services; if you’re more interested in a many-trick pony than a one-trick pony, it’s worth checking out. But if you do want a one-trick pony, as of right now, GasBag offers the best mix of features, stability, and performance.